OPTIONS VORTEX FILTERS New Media! Tubular Retro-Media New! SuperPond floating pellets with Micro-Grooves and much Greater Surface Area! FILTER RATINGS: Use this chart as you consider each filter type. CLEANING: frequency, ease, efficiency, etc. SIZE: actual size, installed size, hide-ability, etc. LIFE EXPECTANCY: expected life of filter itself, availability of parts, redundancy, durability, etc. COST: initial cost, parts maintenance, cost of replacement parts, etc. It may be necessary to build your first pond with less than the best filter. Generally the cost of high performance filters increases as the performance level increases. Note that cost may become less of an issue if the filter makes your pond a real enjoyment over a 15-30 year period. For such a long period, it will become the least important consideration when compared to such things as efforts required to keep the pond clean. Also note that all of the above filters perform best in conjunction with installation of the recommended UV sterilizer. Best Small Pond Filter Ever! Now you can have it all! Our new 3 stage pond filter offers clean and clear water for your small to medium sized pond (500 gallons to 3000 gallons max). The filter has an operable flow range of 700 gph to 1100 gph max flow during operation. As with all filters though, lower flow rates usually result in longer runs, while higher flow rates result in shorter runs and more frequent cleaning. UV - UV Sterilizers will perform best at lower flow rates, ie 600-700 gph flow through the 11 watt UV and will kill most if not all of the algae and bacteria.. When used on a pond that is too large, the algae will grow faster in the large pond than it is being killed. When used on 700 gallon pond, it will work at peak performance. Use multiple filters for larger ponds, ie one for each 700-1000 gallons, or use additional UV Sterilizers such as our SPUV36W along with the filter. FILTER The filter is sized to handle from a 2000 to 3000 gallon pond ( pushing it!). The filter can handle higher flow than the UV can handle. Rather than increasing the flow to the point that the UV portion doesn't work your would be better off in using multiple filters to increase the size of the UV. The first stage consists of three sets of foam pads, which remove particles to clean the water. The next stage consists of bio balls which collect and store bacteria to remove ammonia, nitrites, and waste material from the pond. The final stage of this filter is the UV sterilizer that kills algae and harmful bacteria, clarifying the water and keeping your fish safe. 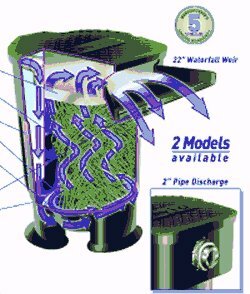 Install a 3 stage filter on your pond system today! New engineering technology through a newly developed, highly specialized central diffuser column virtually eliminates internal friction loss and clogging problems associated with other bead systems on the market. Add in the fact that this filter is designed from the beginning to operate with energy efficient low head Superfalls pumps, and you have the best filter available! Even the pro's say it's too good to be true, but this is one product that is compact and truly performs, without having to install a filter as big as your car next to your pond. And best of all, you never get your hands wet while cleaning. 4.4 Cu. Ft. 8.8 Cu. Ft.
.Use 20 lb for .6 cu ft. @ $4.20 / lb. Use 40 lb for 1.1 cu ft. @ $4.20 / lb. .Use 80 lb for 2.2 cu ft. @ $4.20 / lb. Use 160 lb for 4.4 cu ft. @ $4.20 / lb..
Use 320 lb for 8.8 cu ft. @ $4.20 / lb. The Minimum Flow Rates indicated in the chart indicate the minimum flow rates required to backwash. Flow rates during the normal filter cycle can be significantly slower than indicated in the chart. However, during the backwash cycle, you must have the ability to increase the flow to the minimum rating for a proper backwash, or use the blower to achieve maximum backwash with least water loss. The maximum flow rates listed are a cross section of two factors. Mechanical control head port size for efficient flow without significant restriction, and contaminated water contact exposure to the billions of beneficial bacteria residing within the filter. Without a doubt, slower flow during the filter cycle is better, but, a faster flow rate also places the recirculating water in contact with the media more frequently, netting near identical nitrification results. The Maximum Pressure Rating all Aquadyne systems is a whopping 50 psi ! --- We actually consider this a non issue, because the Central Diffuser column on our filter is so efficient and non-restrictive that you would have to install a 5HP pump and have the filter half clogged to put anywhere near 50 psi on the tank. This simply would not occur in any practical application so we consider it just a perk. On The Other Hand, you should be aware that due to the spin welding that some competitors must use to attach fittings to their tanks, and thin tank wall construction, they can only rate their tank pressures at 15 psi maximum. Hardly sufficient for medium head pumps capable of any decent flow rate. This is the next generation of filters and the best tool for Koi ponds. 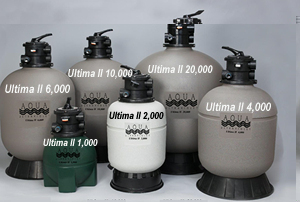 The Ultima II is specifically engineered to meet the environmental demands of ponds. The lightweight media is designed for very high flow rates. There is a patent pending on this tubular media which has low head loss and a very high biofilm surface. The “Y” shape on the inside and wings on the outside affords a protective surface under backwashing and our patent pending backwash system will keep the media from clogging. The same properties have been added to this media in three different sizes with random lengths and diameters to avoid stacking. One cubic foot of Ultima II media is equal to 750 square feet of surface area. Cleaning the filter is done by internal jets. SkimmerFilter base unit. Has two built-in UV ports, skimmer basket, filter for ponds to 1000 gallon size. Base Unit and one Weir Inlet are priced and sold separately. UV's Optional and extra as shown. Savio has changed the way we build ponds with its new SkimmerFilter combo. The SkimmerFilter base unit can take care of skimming ponds to 8000 gallons with flows to 8000 gph. Internal ports (2) allow for the addition now or later of two UV sterilizer units. These are the easiest UV's to clean - simply twist to unlock, remove, wipe, and reinsert. No screws, or anything to take loose to clean. A large trash basket collects leaves and trash for simple removal. The SkimmerFilter has a built-in filter pad which is purported to be able to handle ponds to 1000 gallons. Anything larger should have a supplemental bio-filter. Three different size skimmer weir inlets are used for different sized ponds or flows. Order the base unit, and the appropriate weir inlet for your pond. This wonderful skimmer can be installed in concrete ponds or liner ponds. The extremely strong unit comes with a very strong lid, which is strong enough to be walked on, easily supporting a couple of football players (if necessary). Note: Savio has now replaced all UV Sterilizers with their new model (INEX), which does not require the use of a sleeve, but requires a new model of UV mount, new transformers, and of course new lamps. See New! below. UV lamp (optional) fits into ports built into SkimmerFilter base unit . Easier to clean and maintain than almost any UV. Twist locks into base unit port. A great thing just got... smaller. Designed on our best-selling Skimmerfilter platform, the Compact Skimmerfilter provides dynamic multi-stage filtration in a smaller package. Select the filter to fit your construction plans. The model F100 has a 22" waterfall curtain weir and creates an instant waterfall. Pond liner attaches to the front of the filter under the curtain weir to direct flow to the pond. Model F200 allows a different way to direct your filtered flow to a distant waterfall or directly back to the pond. The F200 offers you a chance to hide it in a remote location, ie. behind a building, shrub, etc. and pipe the water where ever you want. The 2" pipe discharge fitting allows you to attach a male adapter (not supplied) and pvc pipe directly to the filter to deliver the water wherever you want. Flow exits the filter through the bulk head fitting, down an elbow through approximately two feet of pipe, then continues via another elbow toward the pond or waterfall. Both models come with one box of Spring Flo filter media and a top polishing filter mat to remove the finer particles. Both models come with a very strong lid, capable of supporting the weight of a very large person without damage. More than 500 sq ft of surface area per one cubic foot bag! 04-BIOBLOXS Small Mesh Bag of Bio-Blox 1/2 Cubic ft. $26.99 ea. 04-BIOBLOXL Large Mesh Bag of Bio-Blox 1 Cubic ft. $41.99 ea. 04-BIOBLOXXL ExtraLarge Mesh Bag of Bio-Blox 1 1/2 Cubic ft. $56.99 ea. In keeping with our preference for low-head filtration and pumping systems, we introduce you to the Options Range Vortex system. This easily installed bio-filter system is manufactured in the US of heavy materials with true cones in the bottom to collect and concentrate waste for complete removal when necessary. Sizes available for ponds to 10,000 gallons. 4" / 4" / 2"
4" / 4" / 3"
6" / 6" (or 4")* / 3"
*04-VT3500 outlet can be installed as either 4" or 6"
PRIMER FOR VORTEX FILTERS The best type of bio-filter may be the Vortex filter due to it's simplicity, ease of installation, and the energy saved when used with our Superfalls super energy efficient pumps. We offer the best two choices of Vortex filter systems to give you a choice and to meet all of your needs. DESIGN CONSIDERATIONS: The system requires the first stage (or tank) of the "train" to act as a settling chamber, and the remaining two stages to be installed in series, to filter the waste material from the water. A single train of Vortex filters can handle a flow of about 4000 gallons per hour. Two trains of filters (6 tanks) can handle a total flow of 8,000 gallons per hour. It is not required that all of the water being pumped must travel through the filters. There-for it is possible to install your pump(s) to draw water from the filters and from the skimmers or other sources of filtered or strained water. The pump (either centrifugal or submersible) is installed to draw from the last stage of the filter either by attaching the pump suction to the wall of the filter, or by installing a submersible pump into the last stage of the filter. Isolation valves should be installed on the inlet to and the outlet from the filter train to allow for draining and cleaning of the system when required. For these type of filters, we normally use Spring-flo bio-media in both of the two filter sections. The Spring-flo is a "ribbon" of filter material which is unwound from a spool into the filter tank. Other medias such as filter mat, brushes, and light weight gravels are available for use if desired although we and most Vortex "aficionados" have come to prefer the Spring-flo. For really large ponds of greater than 10,000 gallons, we recommend two or more trains of these filters. They should each consist of one settling chamber and two filter chambers for complete filtration. Depending upon which model of Vortex filter is chosen, the flow through each Vortex string or system can be as high as 3500 - 4000 gallons per hour. At least one 4" bottom drain should be dedicated to each Vortex train of filters. An even better design would be to install two bottom drains for each string to preclude the problems possible if one bottom drain were to plug up with leaves, dirt, etc. Lids are included with all Superfalls Vortex Filter Systems (3 or more tanks) and are available for all of the "Options Range" models except for the 04-VT3500. All models, except for the "Options" 04-VT3500, can be installed onto a flat surface, such as concrete pad (when ordered with the skirt). The largest of the Vortex filters, the "Options" 04-VT3500 is available only for burial in the ground due to unavailability of Lids and Skirts for this model. BELOW GROUND INSTALLATION: The most common way of installing a vortex filter is to dig a trench large enough to hold the complete train when assembled (note the above ground installation method below). The Settling chamber is placed into the pit and all plumbing from the pond is attached with the rubber couplers provided. The drain is plumbed to allow cleaning. One of the four separate outlets provided for each tank is selected and the end is cut off. A filter tank is plumbed for draining as with the Settling chamber. Two appropriate outlets are selected and cut off for each of the filter tanks and the tanks are mated with each other and with the Settling chamber using the rubber couplers provided. The pump is attached to the last filter tank and the system is ready to place into service! Vortex systems which can be installed in the ground are the Options Range models, ie. 04-VT1000, 04-VT2000 or 04-VT3500. 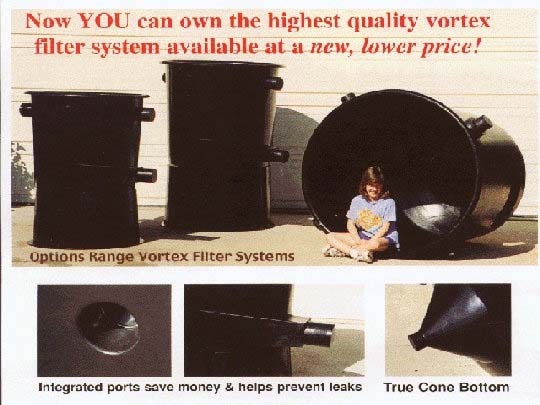 ABOVE GROUND VORTEX SYSTEMS: Vortex filters can be used very effectively to filter water from a tank, above ground, or even an in-ground pond by placing on a flat surface. When the Vortex train is above the surface of the water, the water must be pumped out of the pond or tank into the settling chamber, where it flows through the system until finally discharging back to the pond. When the Vortex train is standing at the same elevation as the pond or tank, it can often be set up to run in the same manner as with the below ground installation, ie plumbed so that the pump draws out of the last filter tank, and returns the water back to its source. The Settling chamber of course must have an unobstructed flow from the pond/tank. Vortex systems which can be installed on a flat surface are the Options Range models which have optional skirts available, ie. 04-VT1000, or 04-VT2000 (skirt not available for 04-VT3500 model). OPERATION: The Settling chamber is plumbed directly to the pond's bottom drain so that when water is pumped from the last tank in the train, water rushes from the pond's bottom into the Settling chamber. The flow is directed into the chamber in a whirl pool fashion which forces heavier waste material toward the center to settle to the bottom for later removal. A separate drain line & valve is installed to flush the waste material from the settling tank periodically. This settling Chamber is also used as necessary to serve as a handy way of cleaning the Spring-flo occasionally. * The Settling Chamber discharges it's clear effluent into the first of the two filter chambers where the Spring-flo filters the water prior to discharging into the third tank for the final cleaning. After the final cleaning in the last chamber, the clear water is pumped to a water fall, UV Sterilizer, or back to the pond. *CLEANING: The pump is turned off and the filter train is isolated to allow draining. Dirty Spring-flo is lifted out of it's filter chamber with a rake and dropped into the Settling chamber where it is swirled around and rinsed. When clean, the filter chamber is cleaned, and the Spring-flo is returned to the filter chamber, the Settling chamber is rinsed clean, then returned to service. The Vortex design allows for easy installation, rapid cleaning when necessary, and best of all, it is a "low-head" filter. This is to say that there is very little pressure drop across the filter as it accumulates waste and dirt from the pond. 1000 GAL. Includes 25 linear ft. 04-FM1000, 55 gal plastic drum with top removed, 2 inch PVC pipe, filter outlet, and bottom drain installed. This up-flow filter will accommodate a 1000 gallon pond or tank when a pump of adequate size is installed. May be used with Pond Master1200, or any of our own SUPERFALLS pumps (when flow through filter is limited to 2100 gph). For larger ponds, 2 or 3 "Big Blue" filters may be installed in parallel for use with a single KJ4000LH pump. Koi Joy's collection trap connects' directly to the pond's bottom drain line (3" or 4") and skimmer to collect debris from pond. Water travels upward into the strainer basket, and then through the basket into the collection tank where it is drawn into the pump. The pump is connected via a 2" bulk head fitting (supplied). Debris is left behind within the strainer for easy removal and cleaning. Saves a lot of effort and time that would be spent cleaning your pond, leaf trap, or pump internals. Available for 3" pipe 04-LCT300 or 4" pipe 04-LCT400 Supplied with lid (not shown), strainer basket 04-LCB300 or 04-LCB400, leaf basket filter media 04-LBFM25, and 2" bulk head fitting 03-BHF200. With this system, you can now clean your pond by sweeping stuff directly into the bottom drain to be swept into the collection trap. This easy to clean trap will hold weeks of bottom debris for later removal. Now you won't have to worry about leaves plugging up your pump or your skimmer. When it fills with leaves or algae, simply pull it out, rinse out with garden hose and return to drum. It's simple slip fit makes removal and replacement easy and painless. Plumb your centrifugal pump directly to the drum with one of our bulk head fittings (not included) for strained water or simply place a submersible pump into the drum with its hose leading to your filter. A simple yet effective way to decrease your pond maintenance duties and protect your koi! 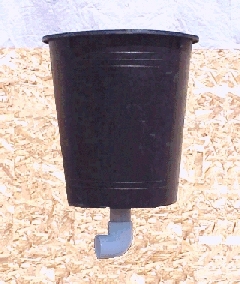 The Inlet Strainer is constructed of 2'' Perforated pipe ( for minimal restriction) a Tee and 2 caps. Available with a check valve for pumps that are not self priming. Approximately 3 1/2 feet across to allow a large surface area which cannot easily clog or become obstructed. Perfect for a pond that was not originally built with a bottom drain when adding a centrifugal pump. Install at the bottom of the pond, over the side, or by penetrating the liner with an elbow and appropriate length pipe. 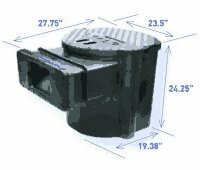 04-INLSTR Inlet Strainer without check valve $49.99 ea. 04-INSTCV Inlet Strainer with check valve $73.99 ea. Our 5 ft long sections of 1" schedule 40 pvc pipe covered with 1/8" slots are perfect for building your own bio filter or even making an under gravel filter on the bottom of your pond. Cut and glue sections together to form your under gravel filter grid - no supports are needed! Connect to your pump system and cover with 8" - 12" of a suitable filter gravel such as our BALANCE above. For ease of cleaning, install an air backwash manifold of pvc pipe under the grid as described below. This will allow you to clean the gravel by backwashing with air (see our backwash blower in air section of this catalog) and water. 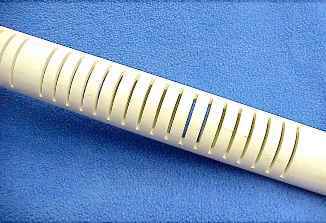 Our white 42'' long sections of 1'' plastic pipe are molded with 1/4" holes which makes them perfect for building your own bio filter or even making an under gravel filter on the bottom of your pond. Other sizes available include: 1-1/2'', 2'' and 2-1/2'' These pipes fit perfectly into 1", 1-1/2'', 2'', and 2-1/2'' PVC fittings. Cut and fasten sections together to form your under-gravel filter grid - no supports are needed! Connect to your pump (PondMaster) system and cover with 8" - 12" of a suitable filter gravel such as our BALANCE above. For ease of cleaning, install an air backwash manifold of pvc pipe under the grid as described below. This will allow you to clean the gravel by backwashing with air (see our backwash blower in air section of this catalog) and water. NEW! Now available in black that fits the outer diameter of PVC pipe. Available sizes include 1'', 2'', 3'' and 4''. Media Rating 1-10 Type / Advantage Form Weight Surface Area / ft3 Brand Cost/lb. Cost/cu. ft.
04-ACTC40 8 Activated Carbon Granular 40 lb ? ? $5.25 ? Media required for Sand Filters- Measure the volume of water that your filter (or purchase the sand filter from us PLEASE CALL) will hold when slightly more than 1/2 full to determine the cubic feet of media required. 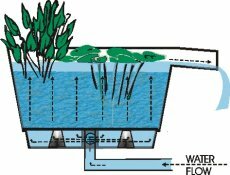 For reference, 1 cubic foot is equal to 7 1/2 gallons of water, and would normally replace 100 lb of sand in a down flow pool filter. Another way to determine the volume of your media, is to take the weight of sand in lbs. required for your filter, and divide that number by 100 to determine the cubic feet of media required for your filter. This same formula will apply to any replacement media for your filter. 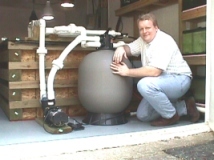 Example: A TR 2 model 60 sand filter uses 325 lb of sand. 325/100 = 3.25 cubic feet of sand, which means that I would have to order 3.25 cu ft of new media to replace the sand. 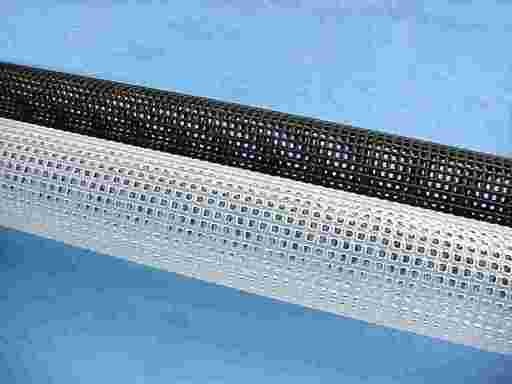 Our new tubular media 04-KJTMHS works well as a replacement for sand in most pool filters. Due to it's unique shape and light weight, this media passes high flow without excessive plugging, while allowing for easy backwashing. The media is manufactured with small fins along its outside surface, and is extruded with internal vanes to give the media an extremely high surface area. Used to replace sand in filters, this media increases flow and allows use of energy efficient low head pumps such as our Superfalls KJ11000LHC (or other). Works well with sand filters which use a multi-port valve with ports which will retain the media within the filter tank. Look at the bottom of the multi-port valve and verify that the exhaust ports on the it's underside will not pass the media during backwash. Koi Joy maintains a stock of filters which are known to have suitable multi-port valves for this media. Our 1/2 " roll media works well in the DRUM filter 04-UF1000 or any other bio-filter of your own construction. 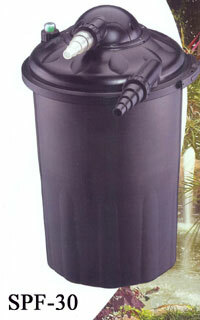 Use a 55 gallon plastic drum such as our 04-PD0055 or one of your own. One roll of this material will treat up to 1000 gallons. Roll comes 25 ft long by 25 inches wide or in two rolls 25 ft long by 12 1/2 inches wide each. 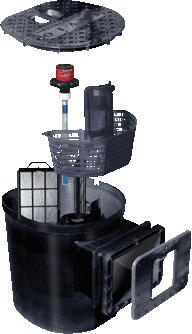 Long lasting and easy to wash, this makes an easily constructed bio-filter for a small pond or a large tank. 04-FM2560 25'' wide cut piece $6.00 per lin. 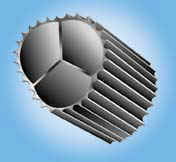 ft.
04-FM1230 12 1/2 '' wide cut piece $3.10 per lin. ft.
04-FM0820 8" wide cut piece (how long?) $2.20 per lin. ft.
BIO-LYTE GRAVEL ZEO-LITE/FILTER MEDIA: NOWHERE ELSE! Our natural zeo-lite gravels have three unique properties. Because of its large void space, our gravel has a tremendous surface area. Some of this large surface area is within the pores and voids, while the rest is on the exterior surface. These two regions of high surface area combine to make one of the most compact media available for filters. It's added ability to remove ammonia directly from pond water as it's generated, prevents the ammonia cycle swings common to most ponds and bio-filters. The ammonia resulting from fish waste and other sources are the major contributing factor to pond fish disease and death. One ft3 of BIO-LYTE GRAVEL can remove more than 1 lb of ammonia before regeneration is necessary. When its ion exchange capability is depleted, BIO-LYTE GRAVEL is still working better as a bio filter media than most others! When depleted, or on a monthly or quarterly basis, simply valve out your filter, turn off pump, and add a solution of salt water. The salt water forces all of the accumulated ammonia out of the BIO-LYTE GRAVEL which is then discharged to drain. Backwash and rinse out filter, and then return to service (we recommend installing an air backwash manifold under the gravel or use of a garden hose & water jet to simplify backwashing). Important: BIO-LYTE concentrates ammonia and therefore prior to recharging, remove from pond or isolate filter from pond to assure fish are not exposed to this higher level of ammonia. Never add salt to pond containing BIO-LYTE or zeo-lyte. BIO-LYTE GRAVEL has a weight of 60 lb/ft3, 50 % of the weight of pea gravel, making it light enough to handle easily. This light weight makes it easier to handle, backwash, and use in almost any container-even plastic drums, Rubbermaid stock tanks, or our square 45 gal SLT-45 filter tubs. Try that with pea gravel or rock! We truly believe our BIO-LYTE GRAVEL to be the revolution in pond filters we've all been waiting for. Use it in your next filter to reduce it's size or replace the gravel in your existing filter to increase it's performance (up to double the performance of pea gravel). Use 04-BL0010, 10 lb hanging bags of BIO-LYTE GRAVEL to hang in pond or tank, or toss into filter to improve its performance. Use one or more bags for each 1000-2000 gallons in pond, or one for each sick tank, show or display tank. Each bag can absorb more than 1/3 lb ammonia from your water. BIO-LYTE GRAVEL polyester weave bags have brass grommets and drawstrings with barrel locks. Remove periodically and recharge with salt as above (frequency depends on number of bags, how well your filter works, quantity of fish, etc.). These are the only way of absorbing ammonia in cold winter pond water after your bio-filter's bacteria has died off. Protect your valuable koi during the winter month's too! This is a high quality granular activated charcoal media, often used for laboratory purification and separations. Sold in boxes of 40 lb for lower cost, this product is a best buy for lab and fish tank purposes. One spool of this ribbon contains a massive 180 ft2 (16.5 square meters) of surface area for bacteria to colonize and may fill from 1 1/2 to 3 ft3 of space. One spool of Spring Flo is capable of nitrifying approximately 1/2 pound of dry fish food per day- equal to a pond with 25 pounds of fish! Sold in the form of a spool of ribbon, you simply let the material unwind freely into your filter box, drum, etc. until the container is full. One 55 gallon drum will hold two of these rolls to handle a 2,000 gallon pond. To clean, just pick it up and shake or stir. Then drain your filter to discharge the dirt to waste. Made in England. 1. Start with a 2" line above the filter which will allow connection to a backwash blower. This pipe goes down to the bottom of the filter where it connects to a "T". Each side of the "T" is reduced to 1 1/2". 2. Assemble enough 1 1/2" and fittings to create a border around the bottom of filter or pond. The border can be 3" smaller than the filter all the way around it. Lay out enough 1" pipe to reach from one end of manifold to other, every 6". At each of these points you will later glue a 1 1/2" X 1 1/2" X 1" "T". This will form your air grid. The maximum size of this air grid depends upon the depth, the power of your backwash blower, etc. (a 1 hp blower can easily take care of 40 ft2 of grid, in 30" - 36" water). If necessary, build multiple air grids. 3. Drill 1/16" holes each 3" along both sides of all 1 1/2" and 1" pipe and fittings to be used to construct manifold and grid. 4. Using 1 1/2 " pipe, 1 1/2 by 1" "T"s, glue the manifold together. There should be enough 1/16" holes drilled to pass the full flow of the air blower or 1,000 - 3,000 holes depending upon volume of air blower can supply. If necessary to increase number of holes, place closer together. Install air grid beneath slotted pipe or perforated pipes above. Good Luck. Filtration & Supplies UV & Ozone Pumps Air Compressors, etc. Important Reference and other Neat Stuff!